External plugins allow you to send notifications to Slack, Hipchat, Jabber or any chat system. Each user must enable the notifications in their profile: User Profile > Notifications. It’s disabled by default. To receive email notifications you need a valid email address in your profile and the application must be configured to send emails. You can also select only some projects, by default it’s all projects where you are a member. 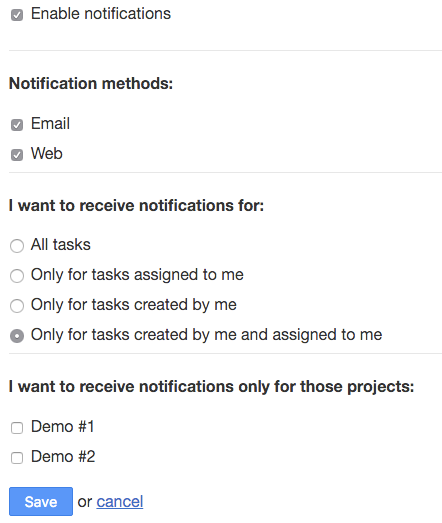 Notifications are shown in a list, so you can mark individual notification as read or everything. In this way you can still get notified without having to receive emails. Kanboard offers the possibility to send notifications when someone is mentioned. At the moment, only the task description and the comment text area have this feature enabled. The user mentions works only during tasks and comments creation. To be notified, mentioned users need to be a member of the project. When someone is mentioned, this user will receive a notification. The @username mention is linked to the public user profile. The notification is sent according to the user settings, it can be an email, a web notification or even a message on Slack/Hipchat/Jabber if you have installed the right plugins.